A low-speed vehicle made by Columbia ParCar in Reedsburg, Wisconsin. If you're looking for a cheap cruise around town this summer, it'll cost you about 33cents to charge up a modified golf cart. Regulation of neighborhood electric vehicles, as the street-legal carts are called, isn't currently in Chetek's code book, but forces-in the form of local man-about-town John Banks-are intent on securing their legality. If Chetek wants to be a retirement-friendly community, officials need to enact retiree-oriented ordinances, Banks insists. "My reason is, be proactive," he urges. "Let's get a jump on this." Mike and Lynnette Leavens, owners of Bloomer NEV retailer Master Cart, can go for 100 miles on $1 of electricity. That's an inexpensive, and impressive, operating cost-but there's a catch. If you're not seeing models like E-MERGE out on the streets, it's probably because the lack of a gas bill doesn't make up for the other expenses. Despite federal attempts to promote use of eco-friendly cars and electric- and battery-operated vehicles, Wisconsin's strict regulations offer little encouragement. 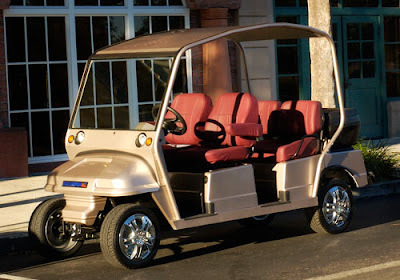 In a number of states, uninsured golf carts can be legally driven through town, but not here. To make NEVs street-legal, manufacturers have to add a host of extras: a parking brake, specially coated windshield, reflectors in the back, headlights, turn signals and stop lamps in the front, seat belts, exterior mirrors and a rearview mirror. Those costs get passed on to consumers. Carts sell for nearly as much as a cheap car, from $6,000 to $7,000 apiece, and that's only going to increase. According to Lynnette Leavens, the 2009 E-merge runs $1,000 higher-and that's just to dealers. Although NEVs are classified as low-speed vehicles-25 mph at top speed-drivers are required to have full insurance coverage. Leavens called around; average cost of a plan: $32 to upwards of $50 per month.